Nikon | Imaging Products | Best of the Rest / Nikon Family Cousins, Part 16 : "Nikon QV-1000C"
Home > Products & Support > Imaging Products > History > Camera Chronicle > Part 16 : "Nikon QV-1000C"
Part 16 : "Nikon QV-1000C"
Time really flies quickly ! This part is the 16th of this series. As the quarterly magazine of Nikkor Club (original publication of this series) is literally a quarterly (issued four times a year), 16 times correspond to volumes of quarterlies for four years. As the series advanced, the original intention was slightly shifted to the different direction. The concept of "to spot-light the 'Unlucky' cousins gone out unseen behind the main products" strayed to the other way ; actually a best-seller model which sold more than a million pieces was introduced in the course of introduction of SLR cameras other than F / F2/ F3 / F4 / F5 series. And, the days come nearer to the present, the story is somewhat too realistic. I intended to insert an episode unknown to this date every time, but sometimes I noticed, after checking the manuscript that it had to be still confidential because it had a close relation to the current product and I was obliged to rewrite it all over again. Such being the situation, the previous part, the F-501 (N2020) and the F-301(N2000) will be the final part of the series illustrated in turn in chronological order from Nikorex 35. Then, coming back to the original intention, the 'unlucky' model introduced in this part is the QV-1000C (see photo). Many people will be at a loss when hearing the name of "QV-1000C", "was there such a model in the selection of Nikon ?" It's no wonder, it is such a camera of illusion as only hundreds pieces exist in the world. This camera is not a 35 mm (135) SLR camera. To tell the truth, it is not an ordinary camera which uses silver-halide film but an SLR type electronic camera. Some of the people may remember "Still Video Camera". That is an analog electronic camera which writes the analog signal of the still picture selected from the motion picture of the TV on the storage media. It was before the present digital (still) camera appeared. Recently, some people call the silver-halide film (still) camera the analog camera, probably to draw it into comparison with the digital (still) camera, but actually the analog electronic camera exists. 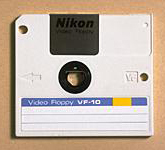 The QV-1000C released in 1988 was a still video camera and the storage medium for it was the "still video floppy" a 2-inch floppy disk (see photo). To tell why this kind of analog electronic camera was developed and faded out without having been known by the people, it might be necessary to explain the relation between the newspaper photo and Nippon Kogaku (present Nikon). Yes, the QV-1000C was the camera developed and produced exclusively for the press. Nikon has been connected with the news photo from very early days, and since Nikon SP and Nikon F were widely used by press photographers, Nikon's relation with the press became more tight. It has been developing over the long period various cameras, lenses and accessories to cope with such purposes as were suggested by the press people. By the way, the most important factor for the news photo is the quickness. To send a photo as quickly as possible from the spot of the event to the headquarters and to print the photo in the earlier edition than the competitor......The competition is quite severe and various new technologies have been developed to cope with that requirement. In order to send photos from the spot to the headquarters quickly, the transmitter is used. In early days, the film was developed at the spot, then it was printed on the paper and it was scanned by the drum type transmitter and transmitted via a telephone line (it was similar to the method of transmitting a black-and-white photo via a high precision facsimile machine at present). However, by this system it requires much labor and time to make a print. A set of easy to assemble dark room (imagine a set of fold-up dark room like a tent for mountaineering, an enlarger and a set of chemicals) should be taken to the spot, or the photographed film must be taken to the dark room of a branch office and be developed and printed. So, Nippon Kogaku developed and released in 1979 the 35 mm Film Direct Transmitter NT-1000 which directly scans the 35 mm (135) negative film, a transparent material, not a print, an opaque material and transmits the reversed image. The development of the negative film alone can be made with a simple dark bag and a tank. Easier developing kit can also be used. A large-scale dark room is not required and the labor and time can be saved. This method is later succeeded by Nikon 35 mm Color Film Scanner / Direct Transmitter NT-2000 (released in 1988) which coped with the color image, and Nikon 35 mm Film Direct Transmitter NT-3000 (released in 1992) which realized the down-sizing and the light weight by introducing digital technology. And these various technologies developed were to be succeeded in the series of Nikon Film Scanner LS-3500, LS-3510AF and Nikon COOLSCAN series, the embodiment of the concept of 'film scanner for personal use' which never existed before, but it is another story. To speed up the photo (image) transmission further, film development will hopefully be omitted......, what appeared then, was a still video camera, an analog electronic camera. In 1981, the MAVICA was released by Sony Corporation and later when this system was standardized for still video camera, it attracted the attention of the press. As what the electronic camera records is the electric signal, if it can be transmitted via a telephone line, the labor and time for film development can be saved. The time between taking a photo and sending it to the headquarters can be drastically shorten. Immediately, at the Los Angeles Olympics in 1984, scenes of the games were taken by digital still cameras and they were transmitted. But there was a big problem; poor image quality. As the still video camera records a frame of the TV image which is the motion picture, as a still image, the image quality is originally not quite satisfactory for a still image. The dot density (number of dots per inch) of the print of photos on the newspaper page is rather coarse compared with the photo print of ordinary magazines and books, but when the picture was printed, the image quality was too poor to be practically used. Nippon Kogaku has long been aware of this problem and due to that reason it has been hesitating to develop a still video camera. But newspapers and press agencies which have close contact with Nippon Kogaku urged it, "develop a still video camera as quickly as possible". Can a still video camera practically usable somehow be developed at any means . . ? The solution to this problem was "an electronic camera exclusively for monochrome use", after studying in various ways. The standard for the still video camera is originally for recording color image, but the color problem is an important factor regarding the image quality. Poor quality in color rendition badly affects the entire image quality. In other words, if, out of limited signals, those for R (Red). G (Green). B (Blue). color signals would be allotted to brightness signals, the image quality might be improved. In short, if the camera would be dedicated for monochrome only, giving up the color, the improvement of image quality might be expected. Thus, Nikon QV-1000C was released as a still video camera exclusively for monochrome at the sacrifice of the color, intended for practical use. As the newspaper photo has been switching over to color around that time, the decision was against the situation, but it was chosen, in order to make a still video camera practically usable somehow, rather than to make a camera of no use sticking too much to the color recording. This was a good choice, as far as the utility was concerned. Still video cameras were used by a few newspapers on trial, and when carrying a photo taken by a still video camera, usually the caption "taken by still video camera made by Xxxxx" was put. As most of pictures were poor in quality, it was a kind of excuse, "it is due to the quality of the still video camera, not due to the lack of capacity of a photographer, nor the poor printing technique". However, the pictures taken by Nikon QV-1000C were never given such a caption in spite of many opportunities of being printed on newspapers. As the quality of the picture was as good as that of a silver-halide film picture, such an excuse quoting the name of the product might not be necessary. Thus the QV-1000C has lost the opportunity of being known by people, because its quality was good enough for practical use; it was an irony of the fate. 1988 was the year of the release of Nikon F4. 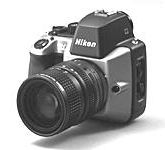 Nikon QV-1000C was designed, in the same operating system of this F4 as much as possible. It was considered to make the operating characteristics similar to that of the F4, as it was anticipated that both models would be used at the same news spot. 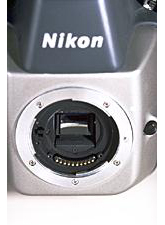 However, the lens mount of the QV-1000C was not Nikon F mount. It was a similar bayonet mount, but a size smaller special mount (see photo). As it is known from the photo, it was an electronic mount communicating signals by 10 electric contacts, without mechanical linkage. Two lenses dedicated to this camera were also developed. Both of them were zoom lenses, QV Nikkor 10-40 mm f/1.4 and QV Nikkor 11-120 mm f/2. As the QV-1000C adopted 2/3 in. CCD (Charge Coupled Device) for imaging device, the focusing distance corresponding to 35 mm (135) format can be obtained by multiplying the number by 4. If converted, the telephoto side was 480 mm f/2, unbelievable specification for 35 mm format zoom lens. As 380,000-pixel CCD, dedicated to monochrome only, with removing color filters, could raise the speed and could be set up to 1,600 in ISO conversion (400 / 800 / 1,600), its specification was quite suitable for sports pictures indoors and at night, along with bright zoom lenses. Apart from the dedicated lenses, Adapter QM-100 to use the normal interchangeable lenses of Nikon F mount in manual focus was also prepared. QV-1000C was developed exclusively for the press and was not sold to general users. The picture image taken can be transmitted by the dedicated Transmitter QV-1010T (see photo) via a telephone line. The result of the shot can be observed on the CRT incorporated in the Transmitter. Still Video Camera QV-1000C was sold as a set consisting of the main body, two lenses, Transmitter QV-1010T, battery and battery charger, all contained in a carrying case and was not sold separately. The QV-1000C was a limited edition because of the system not acceptable to general users; the set price exceeding 2 million yen, only for monochrome, the output of the result only via QV-1010T ......It was a pity that it disappeared without attracting any attention of the world, though it was awarded a prize by some magazine for its beautiful outlook design. Nikon D1, appreciated as a practical SLR type digital camera, has such an ancestor before the "E2" series and the "E3" series.